Attendees: (Chair) Cllr Higgins, (Vice Chair) Cllr Morgan, Cllr Smith, Cllr Wodey, Cllr Pryke, Cllr Bottomley, Cllr Pragnell, Cllr Delafield. 10 members of the public. 1. Receive Apologies: Apologies from Cllr Burgess, Cllr Delafield will arrive late. Cllr Blake, PC Matthew Craker and PCSO Megan Harriett. A member of the public raised concerns about the development at 66 High St North (item 5a.). Reduced parking of 6 spaces, dangerous parking currently occurring on the entrance area. Poor sight lines at entrance and for cars on High St North. Lack of clarity in plans on pumping station. Members of public objected to proposed development opposite 2 Ivy Lane (see 5e below). citing that proposal is outside limit of desirable development. Previous precedent of refusal of development, Poor infrastructure and unsafe roads.1940 hrs Cllr Delafield joined meeting. Two villagers present re Tythe Copse (item 5b) PC minded to support application on the condition that if a new/replacement window is placed in a position overlooking neighbours that it should be obscured. The residents concerned agreed. 2 members of the public expressed an interest in the Oxford-Cambridge Expressway and offered to join the Speed watch team. 3. Declaration of interest in items on the agenda: no interests declared. SPC resolved to object firmly to this plan. The latest site map continues to show reduced parking; poor detail on the pumping station; entrance design that will not work well because of parking; a 1.8m brick wall that does not match well with the streetscape in the area. The Council wish to set up a meeting with the AVDC Planning and the developer. SPC resolved to support this application. No comment. This application lacks detail of what is being proposed. CM/0005/18 & 18/00275/ACC – Red Brick Farm – Cllr Higgins summarised the current position in an exchange of letters with BCC and proposed a meeting date in the latter part of October 2018. SPC has asked senior county Cllrs to attend, including Cllrs Dickman, Chapple and Blake. The, soon to be received, applicants ‘Noise and Vibration’ study will be an item for discussion as will dust and traffic monitoring along with other issues related to the conditions of the permit. The Acting Freight Manager for BCC has offered to visit Stewkley and use of the new budget to mitigate severe impacts eg,resurfacing is not excluded. Photographs of rising dust clouds were sent to the Environment Agency by the PC.Further progress on the site continues with the widening of the gateway and bund building. Contact with the Environment Agency confirmed that the applicant is expected to be applying for relevant permits shortly.These are generally given quickly except for permits for hazardous waste which requires soil sorting and analysis. b. Data Protection and FOI – The filing cabinet at Cygnets has been sorted out. Many thanks to a previous clerk for her work. Some old lists have been disposed of. Further work required on SPC GDPR Policy Statement and to finalise Charges policy this month. Cllr Higgins reminded PC that some lists such as Spinney Volunteers and Speed watch volunteers would need to be kept. FOI policies to be drafted and other council policies will require updating. c. Scout Hut Lease – Cllr Morgan Informed the council that the Lease and Licence have been signed by the Council and have been passed to the Scout Association Trust for their signatures. e. Devolved Services Contract– Letter by Clerk was ratified unanimously and will be sent off. f. Griffin Field Adoption – Cllrs agreed to pay outstanding lighting invoice following decision to adopt Griffin Fields. g. Community transport project – Cllr Wodey met with a group of volunteers. Consideration given to a joint bus project possibly with Ivinghoe and Cheddington. Waddesdon and Buckingham operate a joint scheme which could form a model. The next step is to formulate a survey to discover requirements of all sectors and ages of the Stewkley population. Important to know exactly when S106 money will become available. Clerk to find out. i. EW rail – Twoa report is available to Cllrs by request to the Clerk. Clerk to contact Charles Hurst who attended Open Forum earlier this year and enquire about planned update meetings. j. Dove St – VAHT reported postponement of works. Clerk has contacted residents about leaving bins on pavement. k. Community fund applications – Clerk reported no further applications. Application form requested by Cricket Club. l. CCTV – Cllr Higgins reported that a Facebook petition on a local site showed interest in CCTV but no requests have been made to SPC. BMKALC have been asked for guidance on CCTV. Thames Valley Police sent recent report on increasing levels of crime in this region- particularly tool theft from vehicles also reports of arrests leading to a reduction in local crime. m. Cambs Oxford Expressway. – SPC notes the choice of Option B and to be alert to developments. The Option B corridor boundary lies just North of Stewkley. The southern edge runs through the village. Cllr Higgins informed PC that BBOWT is making a legal challenge based on lack of due process. NBPPC are discussing this later at their Oct 24 meeting and Cllrs Pryke and Morgan will report back. n. Gigaclear update – Cllr Higgins reported that Gigaclear plan to be in village from mid-October and had permit to upgrade fibre cabinets along Dunton Rd in first week of October. o. Parish Council Elections – Cllr Wodey reminded the PC of the lead time to the Elections in 2019, also to remind residents that Cllrs are up for re-election and there may be empty seats. PC decided to organise an advertising campaign with the Grapevine and Stewkley Parish Website for February offering villagers the opportunity to influence the future of their community by becoming councillors. p. AGAR report – The Annual Governing and Accounting Report was received from PKF Littlejohn. There were no issues to report on the financial returns. A ‘Notice of Conclusion of Audit’ has been prepared and published on the Village notice board and on the Stewkley Parish Website on 30 Sept 2018. The certified sections of AGAR 1,2 and 3 have similarly been published. These sections need to be retained for 5 years. 7. 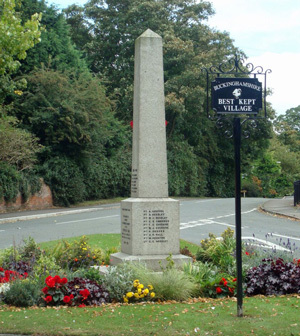 Neighbourhood Plan: No report this month. 8. 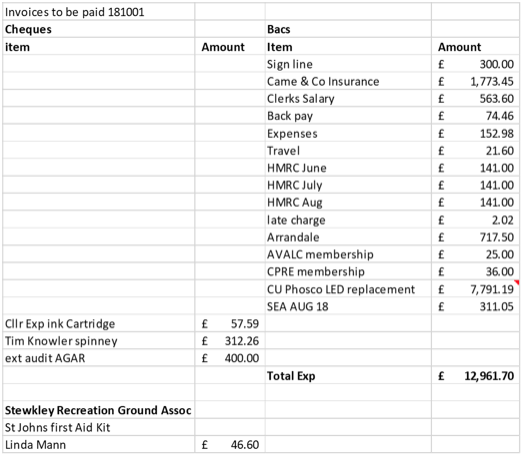 Recreation Ground: New treasurer takes over completely in October – request for monthly financial report prior to meeting in second Wednesday of each month. Rec committee chairman has organised training on the defibrillator that was purchased for the rec by SPC. Training will be delivered at the end of October by a Stewkley-based First Responder. 9. Highways, Footways and Footpaths Lighting: Cllr Pryke reported that the footpath below School Lane had been ploughed and a kissing gate removed by new landowner. Cllr Pryke asked if the footpath should be restored. Clerk to contact A Mc Vail and Stewkley Walkers to inquire further. A white line has now been applied around the outer kerb of HSS approaching the War Memorial to improve road safety, as agreed with TfB more than a year ago. The non-functioning lights below have been reported to CU Phosco. c. Clerk to make a proposal for charges for administrative time and present to council for consideration. b. Budget Monitoring – Cllr Morgan questioned the amount of expenditure in Major Projects section. Cllr Higgins asked where the retrieved income was entered. Cllr Wodey asked for original Budget sheet to be made available in future for each meeting. Clerk to respond to all questions at the next meeting. d. The second half of the precept has been received. Following a resident’s bin complaint against stinking Dog Poo Bins Clerk to insist to ADVC that Bins are emptied every week. Llew Monger Pub Lunch Club initiative part of Community Impact Bucks being coordinated by Cllr Bottomley and assisted by Cllr Morgan. The Swan has agreed to host. Cllrs to meet with Cllr Monger on Friday October 5. Cllr Bottomley reported that an estimate for repair of a village bench near the village hall bus stop of £385 seemed reasonable given the need for removal repair and re-fixing. PC agreed to the estimate. Cllr Morgan to attend the AVDC Our Vale/Spacehive crowdfunding workshop on Oct 10 and report back as this will be a major source of grants and project funding from AVDC.